In Part Two of our look back on the Youth and Reserve season, our attention falls on the Reserve squad, who had another up and down year. An eventual fourth-placed finish with 7 wins and 8 defeats (with a solitary draw) doesn’t begin to tell the story of a campaign which featured 42 players, two home venues and the youngest squad in the reserve league. The club’s final season at Griffin Park may yet turn out to be the final season under the current reserve rules, with the league apparently set for a re-vamp this summer. Everything started, of course, with a new reserve team manager. Steve Holland arrived from Stoke in August after Neil Bath and Adrian Viveash had taken charge in pre-season, and came with a reputation of having worked with and developed some fine young talent in his time at Crewe Alexandra. Pre-season provided ups and downs, with wins over Crawley and QPR, a draw with Farnborough and defeats to Aldershot and the Uzbekistan Under-20 team all overshadowed by a mass brawl against Al-Ahly of the UAE. If Holland had seen fight from his team, it wasn’t present as the league campaign kicked off with a 4-0 defeat at home to Aston Villa. The visitors would wind up finishing national runners-up and were a different class on that particular summer evening, but the Blues found their feet a week later with a 5-2 win away to Portsmouth. Having to play in orange bibs due to a kit clash didn’t prevent Adam Phillip scoring a hat-trick and Fabio Borini adding two more to his prolific pre-season tally of five. The team continued to feature younger players but results were still looking good. Friendlies against Fulham (1-1) and Ipswich (5-2) kept the squad match-fit and when league fixtures resumed a month later, a team featuring schoolboy Daniel Mills Pappoe came away from Wolves with a 1-0 win, courtesy of the first of Conor Clifford’s long range stunners. If September was all smiles, October was inconsistent. Arsenal played them off the park at Barnet in a 2-0 defeat where Chelsea barely saw the ball, but when West Ham arrived at Griffin Park they came off second best in arguably the performance of the season from the reserves. Alex got things going with an early free kick, before Daniel Sturridge and a brace from Borini sealed a 4-1 win, with the consolation coming in stoppage time from ex-blue Frank Nouble. Watford came away from Cobham with a friendly win but points were dropped away to Stoke in the next feature match in early November. Mills Pappoe scored his first reserve team goal and Clifford added another, but a late winner from Diego Arismendi broke Chelsea hearts, for theirs had been a fine performance against a much more experienced unit. The goals continued to flow a week later in an entertaining 3-3 home draw with Fulham, with both Billy Knott and Milan Lalkovic scoring their debut goals at this level. As the calendar moved into the bleak and empty winter period, fixtures against midland teams Birmingham (lost) and Wolves (won) sandwiched a trip to Celtic Park and a friendly against the green side of Glasgow. It was meant to represent the first of a two-legged affair but scheduling issues meant the return fixture was never played. Against an experienced team, Chelsea lost 5-3, with Clifford, Kakuta, and a then 16 year-old Josh McEachran scoring. Things got back underway in February with a busy list of games. Unfortunately, consecutive defeats to Aston Villa, Arsenal, and West Ham, with a loss to Charlton thrown in at Cobham in another friendfly for good measure, did nothing for individual confidence. Kenny Strickland, Nemanja Matic and Marko Mitrovic all scored their maiden goals at this level though, and when Sturridge returned to the fold after a winter of first-team involvement, his two goals helped see off Stoke in early March. By this point home matches had been moved from Griffin Park to Cobham, with the club none too satisfied with the playing surface at Brentford. With the FA Youth Cup dictating Chelsea TV live scheduling, it meant end-of-season wins over Portsmouth and Birmingham (and a defeat at Fulham) went under the radar to almost the most ardent of supporters. The Portsmouth win was most remarkable for featuring a makeshift team with the majority of depth options away travelling with the Dallas Cup squad, meaning schoolboy Reece Loudon and fitness coach Chris Jones both got half an hour on the pitch. Never able to string together more than two wins in a row, but only suffering consecutive defeats during their three-match losing streak in February meant it was a season where nothing really happened. It once again led to calls for not only more meaningful fixtures for players between youth team level and the first team, but more fixtures altogether. When a talented player like Kakuta plays just ten reserve matches all season, suspension or not, there’s a problem. Instead of reviewing each individual, which is often arbitrary and in this case excessive with so many players to get through, each area of the team will get a look instead. Defensively, the team fared quite well, with 25 goals conceded in the 16 league outings, and five clean sheets along the way. Welsh stopper Rhys Taylor led the way with 8 appearances and 4 clean sheets, and offered a security and consistency rarely provided by the nervous and edgy Ross Turnbull. Arriving from Middlesbrough on a Bosman free transfer, he played five matches but early season errors against Aston Villa and Fulham meant defenders and supporters alike were never entirely at ease with him in goal. Jan Sebek fared much better in his two outings, keeping a clean sheet of his own, whilst Sam Walker was excellent on his debut away to Fulham late in the year. Niclas Heimann failed to play a competitive match and looks likely to move on in the summer, with various trial periods abroad already under his belt. A very many players lined up as part of the blue defence in 2009/10, but none more often than Ben Gordon. His eleven appearances weren’t remarkable, but they were solid, efficient, and he developed enough to earn a loan move to Tranmere Rovers late in the season. Nana Ofori-Twumasi also featured semi-regularly at right or centre-back either side of a loan to Dagenham & Redbridge, whilst Nikki Ahamed moved into the right back slot on occasion with seven appearances. Neither really showed any great shakes, but Liam Bridcutt displayed his superior quality and know-how at either centre-back or defensive midfield when he turned out. Kenny Strickland, on a one-year deal after being released by Manchester United, earned a promotion to the reserves midway through the season and largely dealt with the step-up well, tucking away a fine finish at Villa Park, and, one or two errors aside, was neat and tidy. Alternatives at centre-back in Carl Magnay, Sam Hutchinson and Jeffrey Bruma were all more talented but rarely outstanding on the pitch, although Bruma had a fabulous night as captain alongside Alex at home to West Ham. Whilst Magnay and Hutchinson toiled with injury, Bruma progressed further and made his first team debut in November, spending most of the second half of the season with Carlo Ancelotti’s boys. 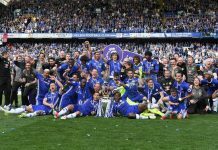 Of all three major teams at Stamford Bridge it was the reserves that persisted with the midfield diamond throughout the season, serving the players who played in it in good stead going forward in their careers. Holland spoke early in the season of players having reached almost all of their technical ability by their late teens and at this stage of their careers it was all about learning roles within teams and tactics. To this end, the most regular quartet of Matic, Clifford, Kakuta and Mellis all performed well and look almost too good for reserve team level. Matic and Kakuta have played for the first team, with Mellis having spent time on loan at Southampton, and Clifford apparently set to head out elsewhere next season for a spell. For his ten appearances and three goals, however, Kakuta had a quiet year, undoubtedly affected by the media furore over him and will be looking forward to a break, coming back fresh next season with the first team squad. Jacopo Sala played deeper in midfield on the right side of a diamond, as opposed to his right wing role in the Under-18 team, but still played very well and led all players with three assists in his six appearances. Things weren’t so smooth for Daniel Philliskirk though, as the majority of his nine appearances came as a substitute and he rarely made an impact on any match, although he did get onto the first team bench for a Champions League match. Gokhan Tore made a similar number of appearances as a replacement, with just one start, and was rather inconsistent, showing he needs to bridge the gap between youth and reserves ahead of next season. Brief outings from Kaby and George Saville act as precursors to next season, whilst Michael Woods was restricted to just three starts because of a series of injuries, the most serious of which was a broken ankle. It came at a terrible time in his career and having lost a season, the second-youngest player to play for Chelsea has work to do to make up for lost time. In attack, Borini and Sturridge top scored with five apiece, but Sturridge often looked the better player, and rightfully so, proving he can also contribute in the right situation at the next level. Borini continues to work hard and the duo struck up a useful partnership, particularly early in the season. In relief of the first choice duo, first-year forward Milan Lalkovic was the unlikely name to step up and feature, playing in eight matches (six starts) and grabbing a goal against Fulham. At times he looked like the raw 17 year-old he is, but he came on leaps and bounds over the course of the season and will be a better player for his early exposure to football at this level. With a lack of other options the likes of Sala and Gokhan occasionally featured as a forward, whilst later in the season Marko Mitrovic made his bow, scoring at West Ham. He will be relied upon more next season, and looks ready to make the step up. Bobby Devyne and Philipp Prosenik both played half an hour each and are a long way from contributing at this level. Ultimately, the year had its good moments on the pitch, and with a healthy number of players making their first team debuts or further impacts under Ancelotti, things are moving as swiftly as they have done for at least four years. What next season’s purported changes hold remains to be seen, and there will be a large dose of loans, perhaps more than the total of nineteen moves this season. In Part Three of our season review, we finish up with the Under-18 team, and the FA Youth Cup winners.